Indore: Bariatric surgeon Dr Mohit Bhandari, Mohak Hi-tech Specialty Hospital and Sri Aurobindo Institute of Medical Sciences (SAIMS), have received notice from the NCDRC on account of alleged botched up surgery of a TV actor Rakesh Deewana, which is alleged to have led to his death in the year 2014. Speaking to Times of India about the case,Harshvardhan Singh Rathore, patients lawyer said, “The doctor and others had shown ‘an unjust haste’ in performing the surgery which ultimately complicated the situation and eventually led to death of Deewana, thus this is a fit case where principles of ‘Res Ipsa Loquitor’ (facts speak for themselves) applies.” The quantum of compensation has not been disclosed. Dr Bhandari told TOI that he was yet to receive any notice in this regard and would respond to it whenever he gets it. 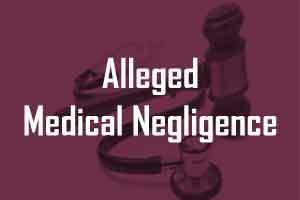 “There was no case of medical negligence. They want to extort the doctors. We have done more than 6000 successful such (bariatric) surgeries,” he said. Rakesh Diwana, had acted in various TV serials including Ramayana, Yeh Rishta Kya Kehlata hai and Taarak Mehta Ka Ooltah Chashmah. It has become a fashion to blame a doctor for negligence after any mishappening.Ask urself why a doctor kill any patient? Is he going to get any advantage out of death of patient? This is the latest trend to encase the mortility of the patient by his relation . It is sad that somebody died after the surgery. Bariatric surgery is changing the body physiology and should be discouraged. Bariatric Surgery has a whole lot of complications. And should not be used as a simple solution for obesity. Complainant	RICHA DEEWANA & 3 ORS. Respondent	DR. MOHIT BHANDARI & 3 ORS. Heard. Issue notice of application for condonation of delay as also pre-admission notice of the complaint to the opposite parties returnable on 19.12.2016.